Dzambala is most well-known for being a Buddha of Wealth and well, everyone wants money! The rich gold colouring of his skin represents increase and growth. In the short term, he can bring us material wealth and help us out of poverty but more importantly, his practice can also bring us to spiritual wealth and personal growth to become a better person. 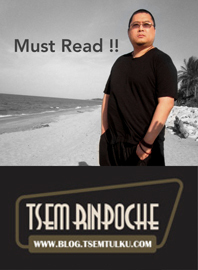 As with all Buddhas, his practice can help us gain the ultimate attainment of Enlightenment. His form is short, fat and stout, which comes from a time when it was widely believed that obesity is synonymous with wealth and luxury. He also carries an arrogant expression on his face and sits in royal posture: this acts as a warning to tell us if we continue to look and act in this arrogant way in our attempts to get material wealth, we actually gain poverty instead. Think! Is our greed hurting others? 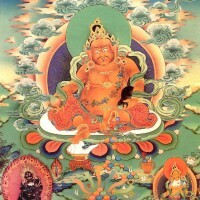 The royal ease of his form indicates that Dzambala is free from samsara – through his practice and attainments, he has also acquired all the money, fame and wealth of the universe and no longer experiences suffering. He can afford to be laid back, chilled out – he’s got everything he needs! He shows us how our practice to him can ultimately lead us to Enlightenment, where we too can literally have everything we want. At the same time, he steps on a conch shell with his right foot to mean that though he has attained all this great wealth, he is above it all and will no longer allow the ties of samsara to subjugate him again. Dzambala holds a fruit in his right hand to signify that if we follow his practice, we can “bear the fruits” of our efforts to gain spiritual attainments and Enlightenment. In his left hand, he holds a mongoose, which in ancient India stood as an omen of good things to come. The mongoose spits beautiful precious wish-granting jewels, and both work to attract us to practice Dzambala with an immediate promise of wealth. Dzambala’s blessings and the value of his practice are universal. Keeping an image or statue of him, or giving a Dzambala statue away as a gift is beneficial to anyone, anywhere.